I really admire women who are single momma's all the time because I don't know how they do it, ALL THE TIME! They are so strong and amazing to be able to be the mom and dad and just get it all done. 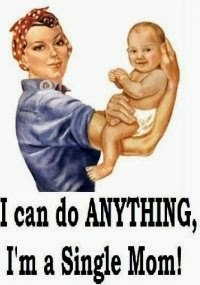 I am going to be a single mommy for the next couple of weeks as the hubs is doing his 2 weeks a year for the military. Right after Mason was born, 3 days, the hubs was deployed for 11 months. I was a single mommy for the first 11 months of Mason's life. I was on survival mode the whole time. I feel like I am going back in that mode right now, but at least I know now how to control it and take advantage of my time and to actually leave the house and do fun things. But it is tough. Being the 24/7 only me for everything. Matt gave me some time to myself before he left and will give me some me time when he gets back too to just help me recover. Again, single mom's you are amazing! I am so thankful for his military job though. So proud of my husband for serving our Country and fighting for our freedom. I can handle 2 weeks. Another year, not so sure. So wish me luck!